Concentus Musicus Wien, with Nikolaus Harnoncourt directing from the cello, playing Johann Sebastian Bach's Double Concerto For Violin And Oboe, BWV 1060 in C minor. The soloists are Alice Hoffeiner Harnoncourt, violin, and Jurgen Scheftlein, oboe. First movement, Allegro, above. Composed circa 1717 to 1720 when he was employed as a court composer for Prince Leopold of Anhalt-Kothen, this piece was also transcribed by Bach as a concerto for two harpsichords. As a work in concerto, or concert form, meant to be listened to with no other purpose except enjoyment of the music for music's sake, we are reminded of how many other works of art were unable to be created by Bach, after he ended up with what was essentially a dead-end job as Kappelmeister of the St. Thomas Church in Leipzig, a position he held from 1723 until his death in 1750. Stuck with having to come up with new music for the church on a weekly basis, as well as conducting and training the choir and small orchestra there, Bach never again had the time, or the freedom, to write very many more lovely, melodic secular pieces such as this concerto. Cantatas, Masses, and Passions served an important purpose in the very much more religious times of the mid 18th century, and Bach diligently applied his genius composing them for the greater glorification of God, but something, maybe the 'fun factor', is missing from his music during his later life. Not so with the Double Concerto for Violin and Oboe - there's a lot of intricate and interesting harmonic interplay going on here; in the slow second (adagio) movement, there is a particularly mesmerizing interwoven double melody shared between the oboe and violin - like a haunting, lyrical love ballad sandwiched in between a couple of up-tempo dance numbers. This is simply some of the finest music ever written by anybody at any time, every bit as enjoyable to listen to now as it must have been then, almost 300 years ago. 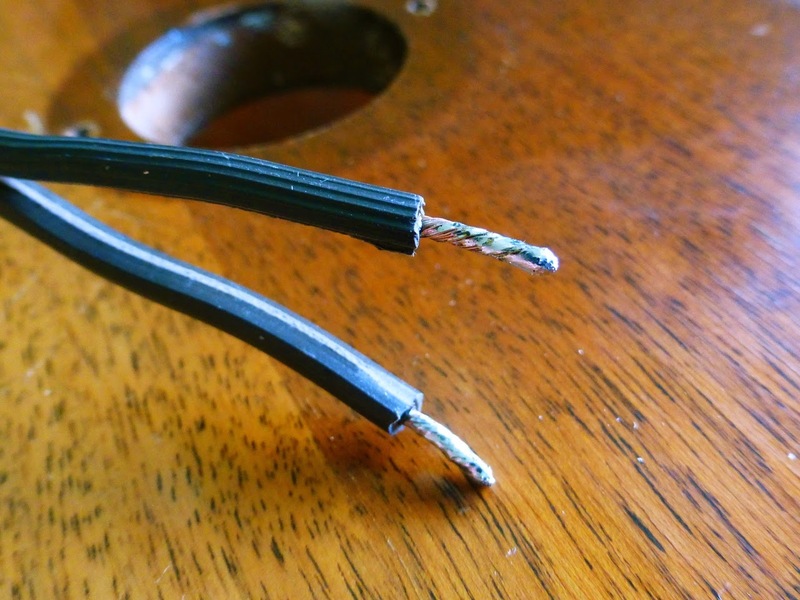 Like most players, I never thought much about guitar volume and tone controls, until one night, just before a concert gig in Maastricht, Nederlands, my main guitar started making loud scratchy noises, and suddenly went dead. Only minutes before the show and desperate, I took the control plate off, bypassed the pots, and wired the switch straight to the output jack. During our set, I was surprised at how much better the guitar sounded - more highs and lows, more volume, and overall a crisper, toneful, and more dynamic sound. Ever since then, most of my guitars have had no tone control. 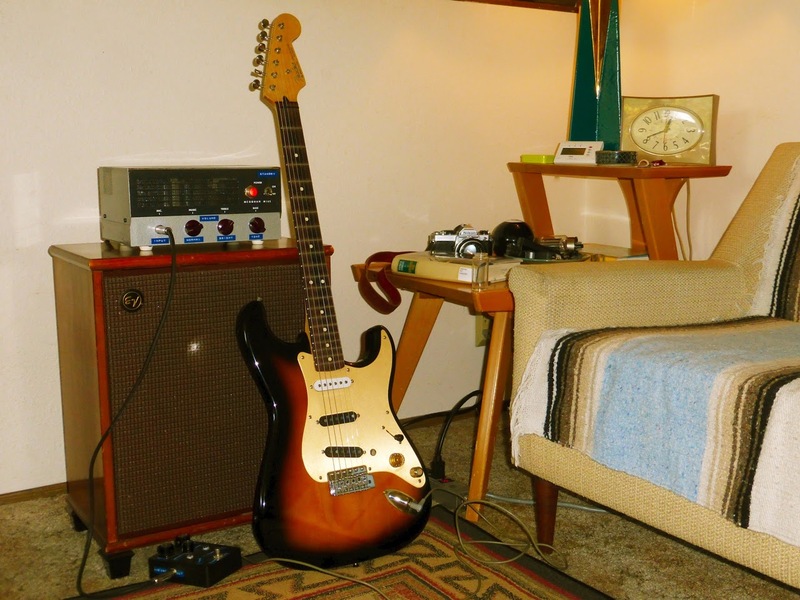 Last year I bought a Strat from David, and he gave me an old tone capacitor to try out with it - an ancient paper in oil cap that many people call a "Bumblebee", and it sounded amazing. 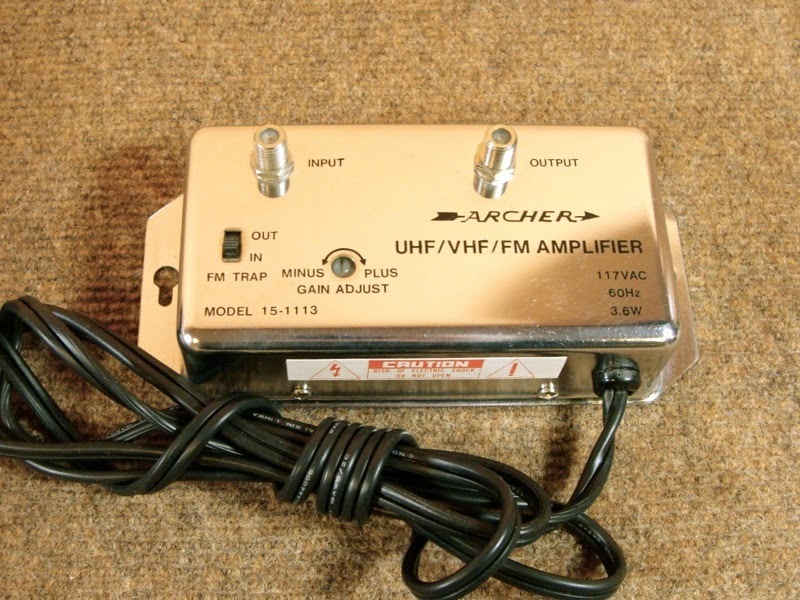 Instead of just rolling off the highs, the tone control had a sweep that was almost like a wah pedal, and within that range were some surprisingly good and useful tones. 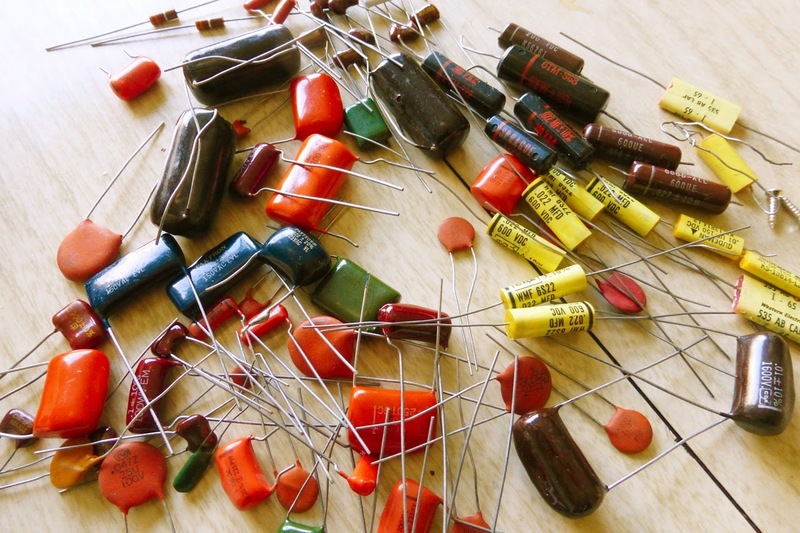 Okay, already that's way too many capacitors. Luckily, most of these caps have values that place them out of the useful range for guitar tone circuits, which is from around .01uF to maybe .1 uF - just to make sure, we'll also test some outside of that range. But - how do we test them? 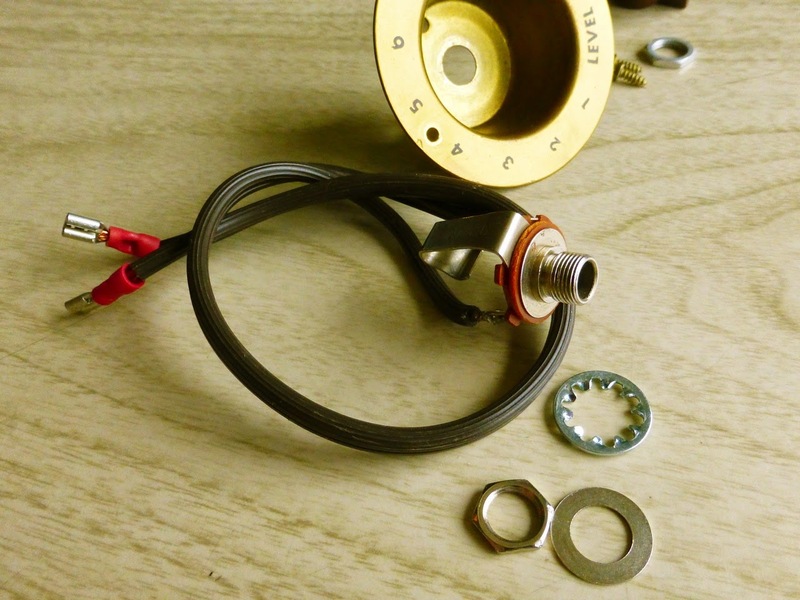 You can use a meter and measure the capacitance, and whether the cap is shorted or open, but that won't tell you how it sounds. 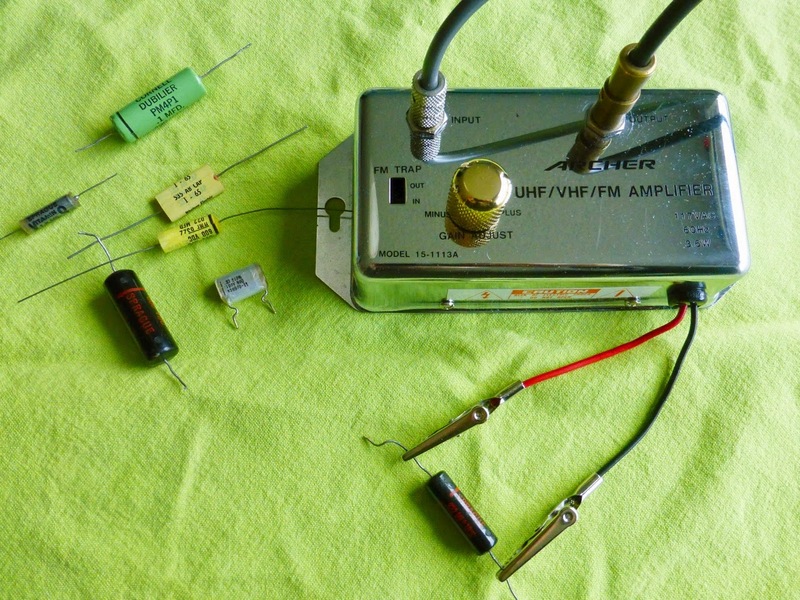 Ideally we need some way of hooking each capacitor up and actually listening to it. Now, let's test some tone caps. To save time, this will be audio testing only - how does the tone cap interact with a guitar pickup, through an amp, and how does it sound? 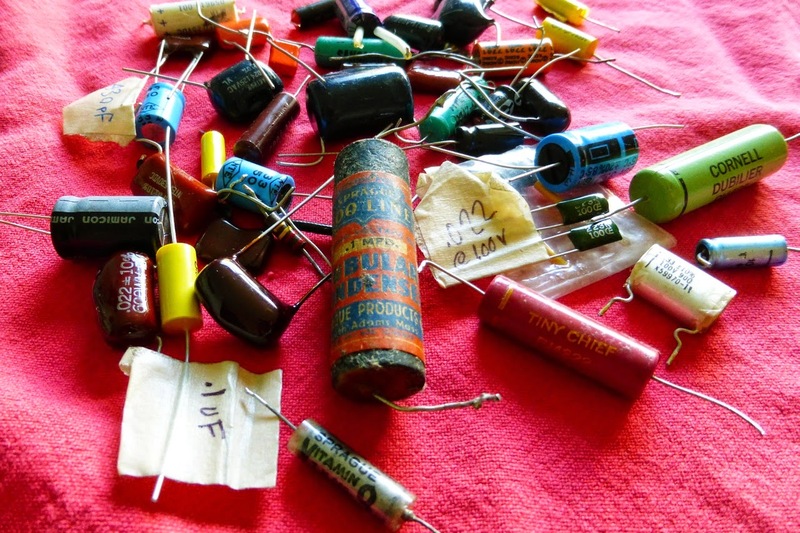 No measuring capacitors with a meter, no internet research, no thinking - we don't need facts or figures, or online opinions. 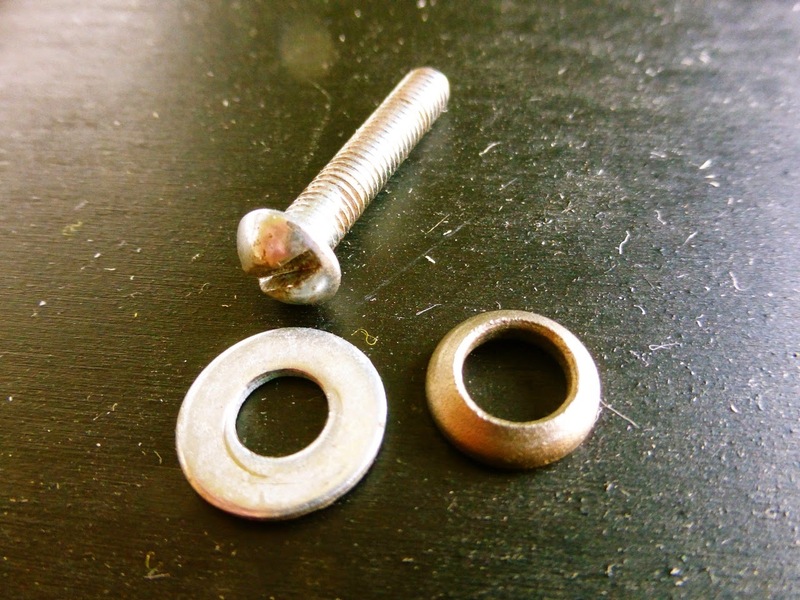 We're just looking for a great sounding tone cap. In order to keep it consistent between tests, only the Strat Parts-o-caster will be used, usually in the middle pickup switch position. And since it doesn't have a tone control yet, only the capacitor being tested will be heard. However, if a particularly juicy sounding cap is found, I may check it out with another guitar or bass. I should say here that I'm not going to talk about construction details, materials used (Mylar? Polyester? Paper in oil? Martian skin and peanut butter? 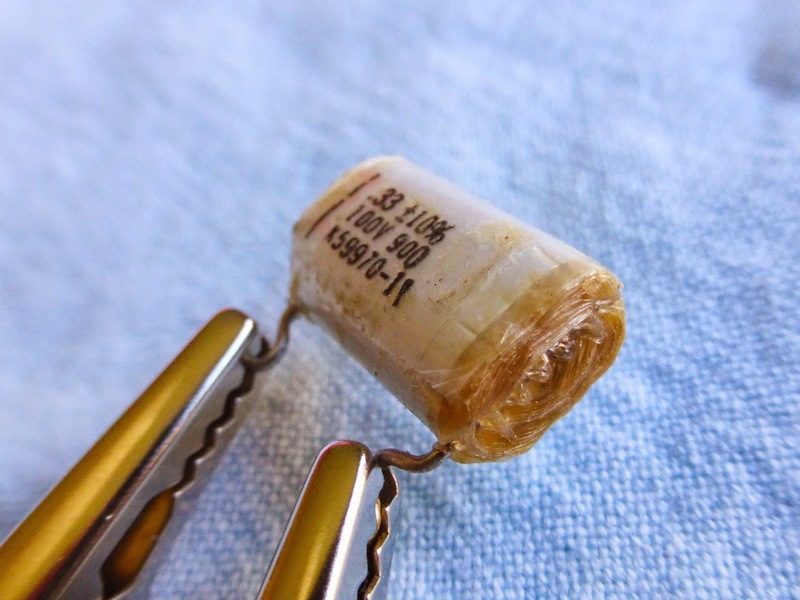 ), or the ages of any of these caps - there's a huge amount of info out there about capacitors, most of it is contradictory, and much of it just sounds like hype or "cork sniffing" to me. I'm a beer drinker, and I'll leave the wine tasting for others. • Unknown maker, .022uF, "10%, 400V, ITWM". 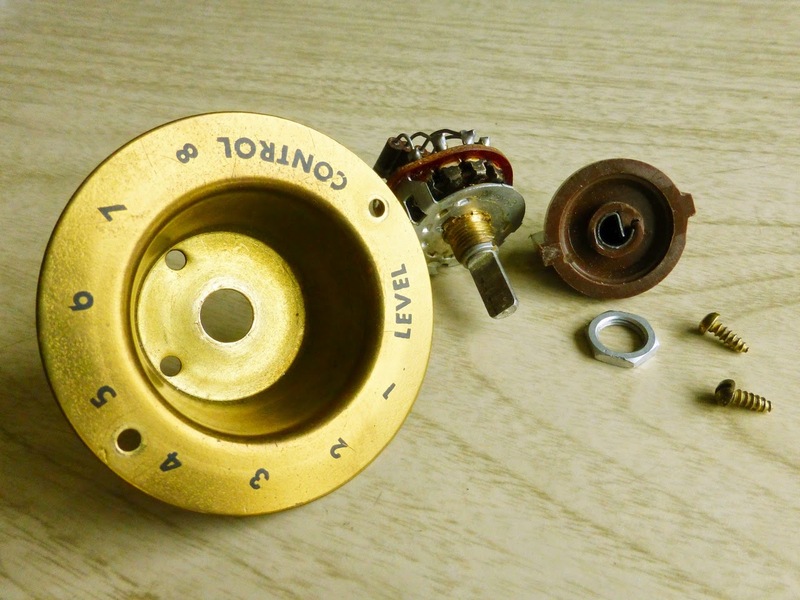 This cap will be the reference capacitor for our tests, since it's the only one in this bunch that I've heard before in a guitar - it's an original tone cap from my '77 Gibson Les Paul Special, which I bought new in 1978. 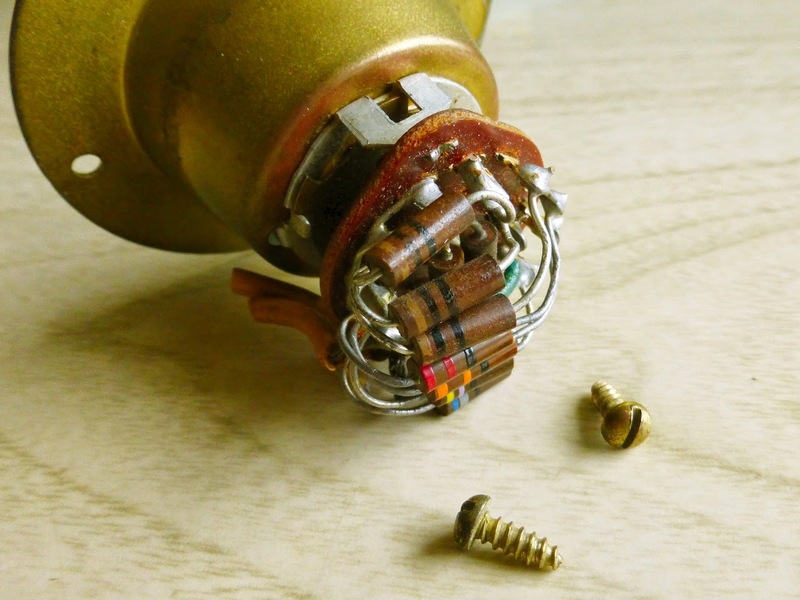 I have to assume, knowing what level of care and craftsmanship that Gibson put into the rest of the instrument, that they knew what they were doing when they picked this capacitor. Audio-wise, it's a perfect example of what a tone cap should be - full up, the guitar's high end still sparkles and chimes, backed off half way you can get some nice J. J. Cale style round and toneful solo lines, and rolled all the way down, you're in full jazz territory - big fat smooth tone, with no response peaks anywhere up and down the fingerboard. Plus, from full counter clockwise up to halfway, there is a very slight, barely noticeable wah-ish effect. Nice. • Cornell Dubilier Tiny Chief, .022uF. "PJ4S22, 400 V.D.C., C-D, U.S.A". This came, I think, from a Hammond organ, and if so they also must have known what they were doing. It's got good tone, very similar to the first capacitor, except that at full clockwise, all the way up, it has just a slight bit more top end. Good range of tone control, also nice jazzy lows, and about the same small amount of wah at the low range as the Gibson tone cap above. 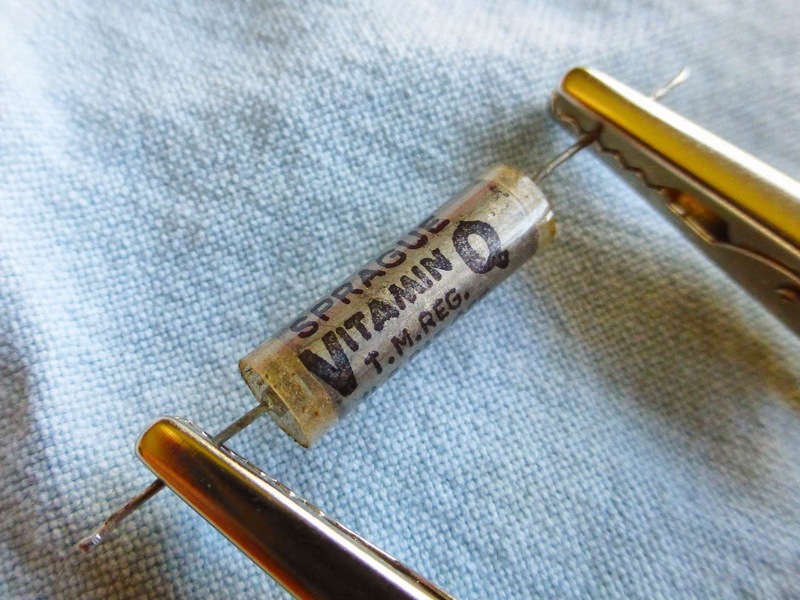 • Sprague Vitamin Q, .01uF, "CPO5A1KE103K, 400 D.C.". 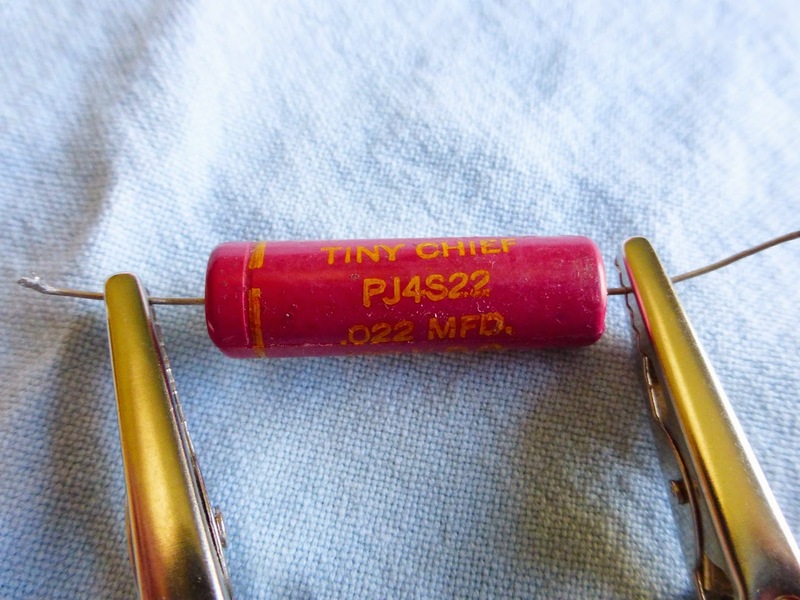 This is one strange capacitor. It basically has only two tones - full up, it does noticeably lose a slight bit of highs, but not too much; then, through most of the pot's range, there's hardly any effect, very little roll-off, until you get close to full CCW (counter clock wise). At that point suddenly there's a strange nasally mid range hump, with less lows as well as highs, and oddly, it becomes a bit louder - it sounds a lot like stopping a wah pedal in mid stroke, except there's no wah effect at all when sweeping the pot. 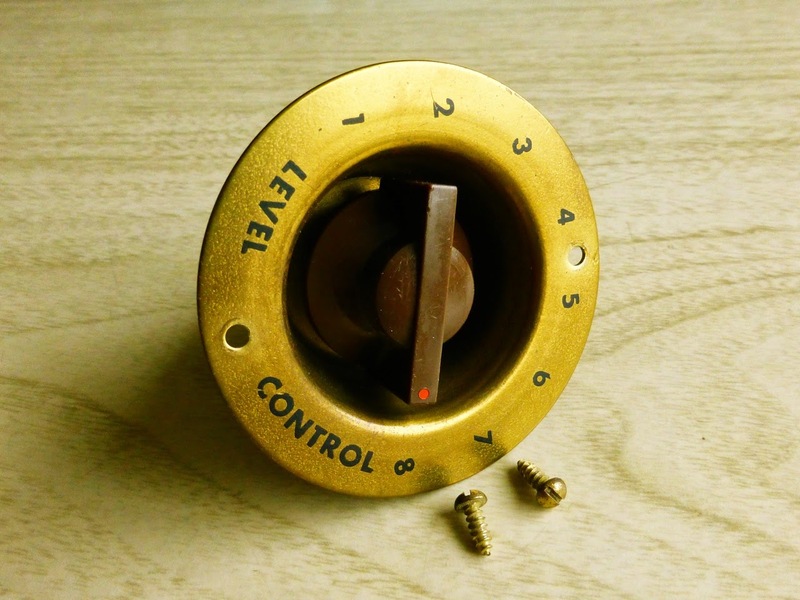 Like I said, very strange, and it might be fun to have in a guitar as an alternate sound, connected to an on/off switch instead of a pot, but as a variable tone cap it's about useless. 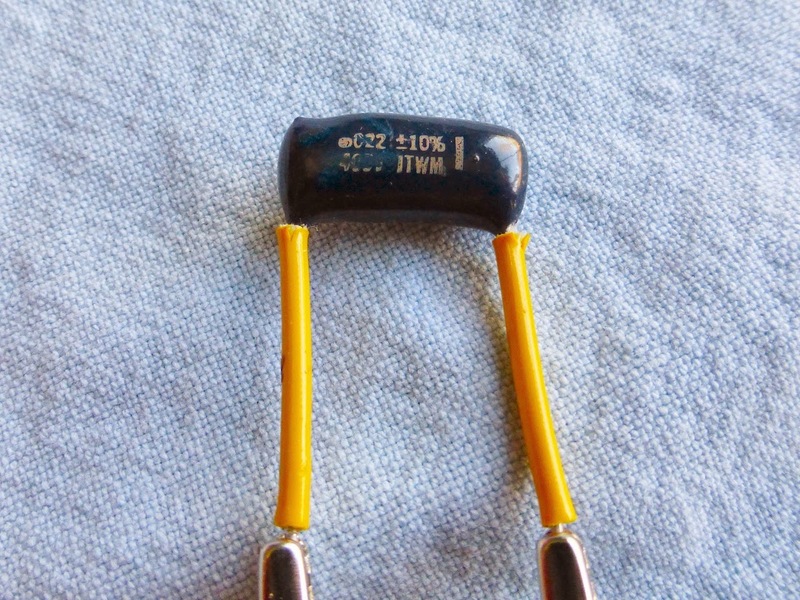 • Unknown maker, .33uF, "10%, 100V, 900, K59970-11". I got this one from Double Dave, and it's from a solid state Conn organ. It's obvious that this cap is made from some kind of rolled paper and foil, and so it looks ultra cool - kind of like a Greek baklava pastry. 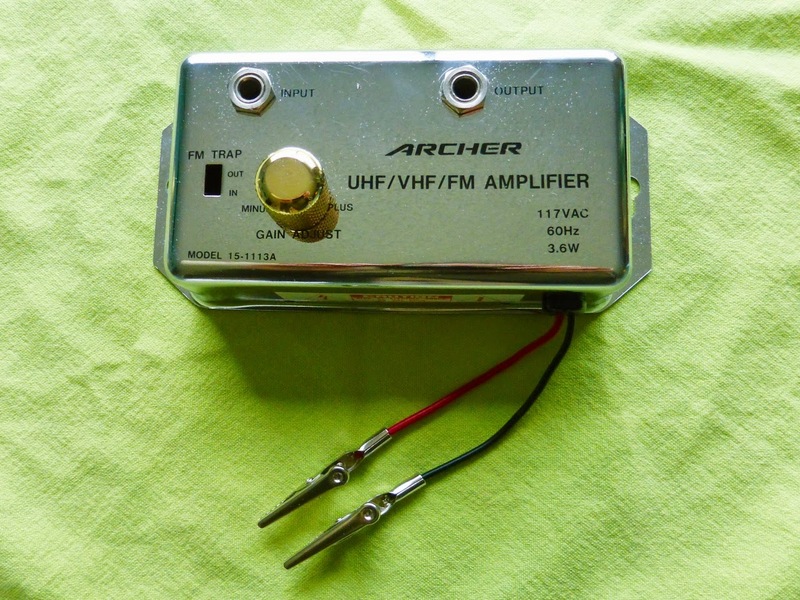 At .33uF, it's way out of the guitar tone cap range, and hooked up, it sounds like it. When you turn the pot, it instantly starts rolling off the high end, with not too much change after that, until at full CCW, it sounds like a giant marshmallow ate your guitar. A noticeable bassy hump around G sharp, and no wah effect at all. 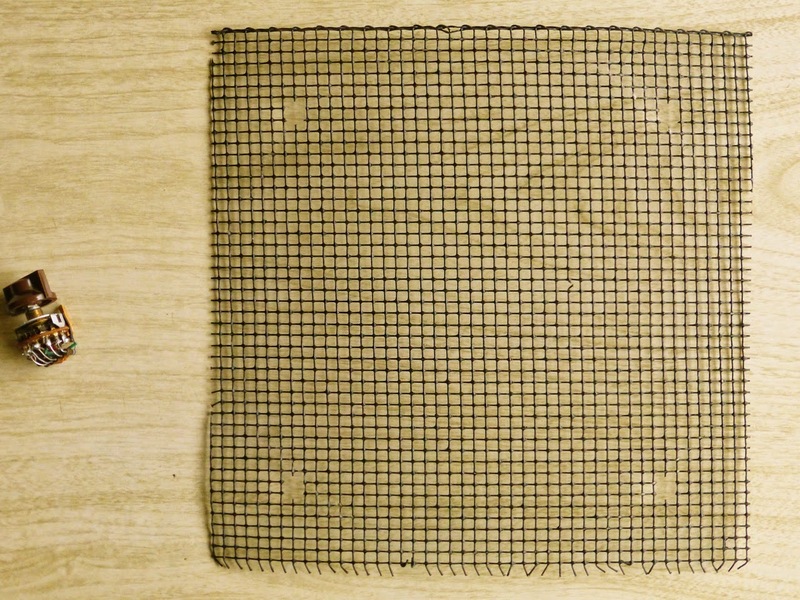 It was fun for a while, emulating the sound of an electric bass made out of sponge rubber. 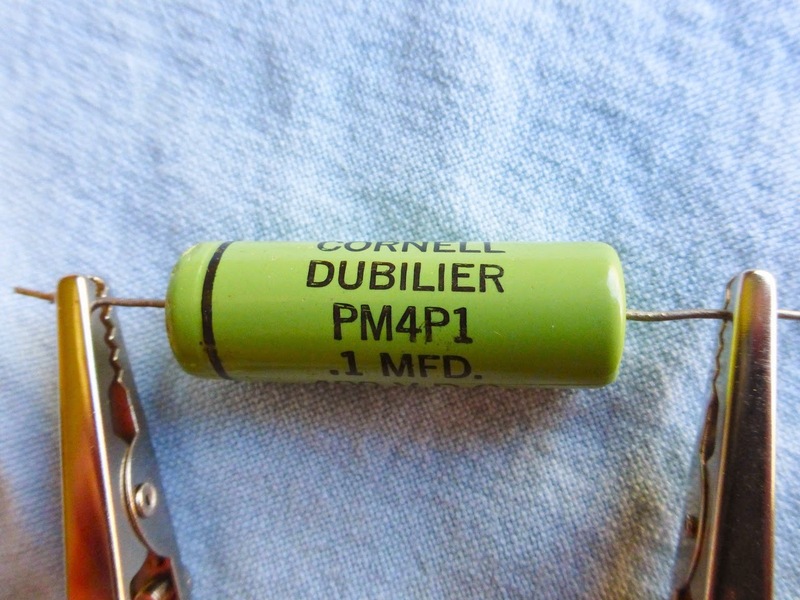 • Cornell Dubilier, .1uF, "PM4P1, 400 V.D.C.". This is another very good tone cap - at full CW (clock wise), the Strat still sounded like a Strat, then there was a gradual tapering off of the highs through the range of the pot, and at full roll off there was, as expected, even less top end and upper mids than with a .022 cap. 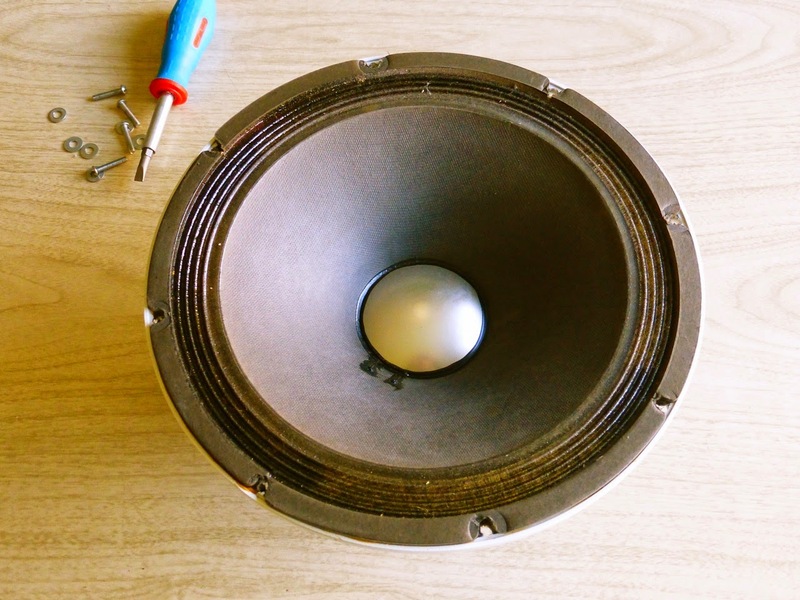 At full CCW, it sounds ultra fat, with no humps or peaks, and I suspect it might make a nice tone cap for a bass. Only a very small wah effect. 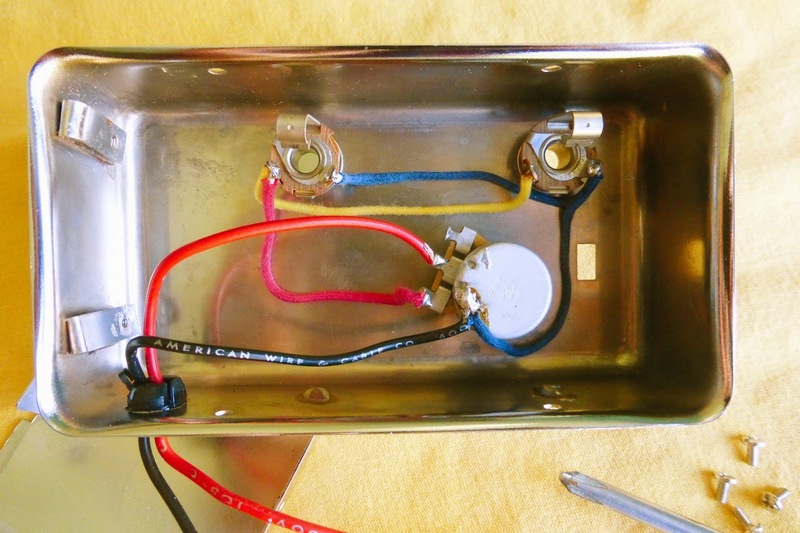 That's it for this installment; in Part 2, we'll test some more vintage and modern capacitors, as well as look at the insides of a 1950s Sprague "Bumblebee" cap. Stay tuned! Most photos above taken with a Lumix ZS-25. Click or tap on any picture to access larger, higher def images. The first movement of Johann Sebastian Bach's 5th Brandenburg Concerto may be considered the precursor to all the piano concertos that have come along since this piece was written in 1721. Prior to this, harpsichords, being by nature soft voiced and non-dynamic, were only used as continuo, or accompaniment to more prominent instruments - violin, flute, horns. 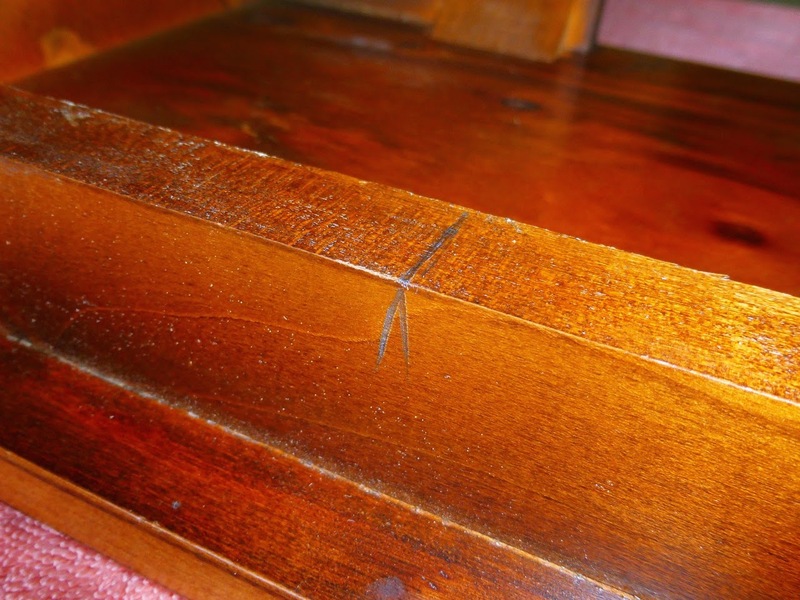 Even if there had been no Bach, the ongoing development of louder and more dynamic keyboard instruments such as the forte piano assured the inevitability of the piano concerto form, most notably seen, and heard by audiences in late 18th century Vienna, in the virtuosic piano konƶerts of W. A. Mozart. Besides his compositional genius, Bach was also a highly gifted organist, stunning listeners of the day with his fusion of the tonal majesty of the most powerful musical instrument in the world at the time - the church pipe organ - combined with his own harmonically intricate compositions and lightning quick keyboard technique. He took that keyboard virtuosity, and transcribed it for the humble harpsichord, and the result was this concerto - listen toward the end of the first movement (above) and hear what the always forward thinking Bach imagined as possibilities for the future of the keyboard. Sometimes I'll see something that I've always taken for granted, and for no apparent reason a kind of perception shift occurs. No, it's not satori or any other sort of awakening, I haven't unwittingly wandered through Huxley's Doors Of Perception, and weed isn't legal here in Oregon yet. It's just - I feel a bit different; it's hard to explain. Taking that picture above was difficult; it was late at night, the only illumination was the kitchen night light, and the closest camera at hand was an older one, with not the best low-light capability. Being half asleep and rather stupid, I didn't want to turn on any bright lights, not wanting to disturb these ants before the shot was taken - I'd forgotten that ants have no eyes, and can't see. These particular ants are really, really tiny. They're newcomers here, and seem to have displaced the ones we've always had, the much larger black ones who used to wander into the kitchen at odd intervals, in very small numbers, just one or two at a time. Those big ones were easy to tolerate, never got in the way, and being so seldom seen, were almost like pets. Not so the small ones, who have arrived in hordes, always ready to take advantage of any kitchen mishaps, such as this previously unnoticed drop of honey. I still see the big ones occasionally, in the back yard, and I greet them like an old friend, but they seem to have lost some sort of battle for territory to these small ants, and never venture into the house anymore. Cooking has become a royal pain lately. 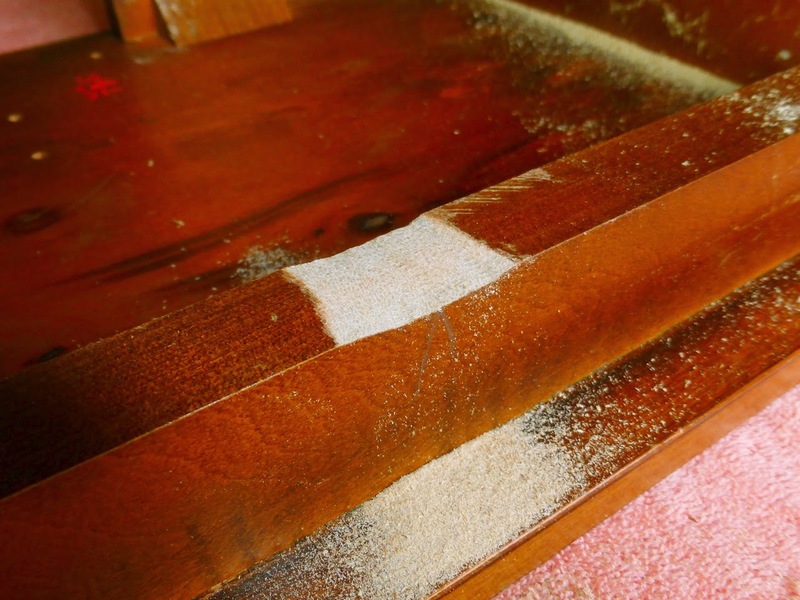 If the meal involves anything these ants might like, suddenly the counter by the stove is swarming with them, and I have to clear them away. Making loud noises doesn't seem to work - I suspect they have no ears, either. Pounding on the countertop makes them run away, but never very far, or for very long. I've swept them away with a feather duster, and that makes me feel maybe like a Jain, one of those holy men in India who have such reverence for life that they whisk the walk ahead of them, for fear of treading on any tiny lives. Ants taste and smell really awful, and if they get into your food the meal will be ruined, so in the extremities of my frustration I've had to play God, and just mopped them up in quantities, while uttering the Klingon battle oath - "Today... is a good day - to die!" 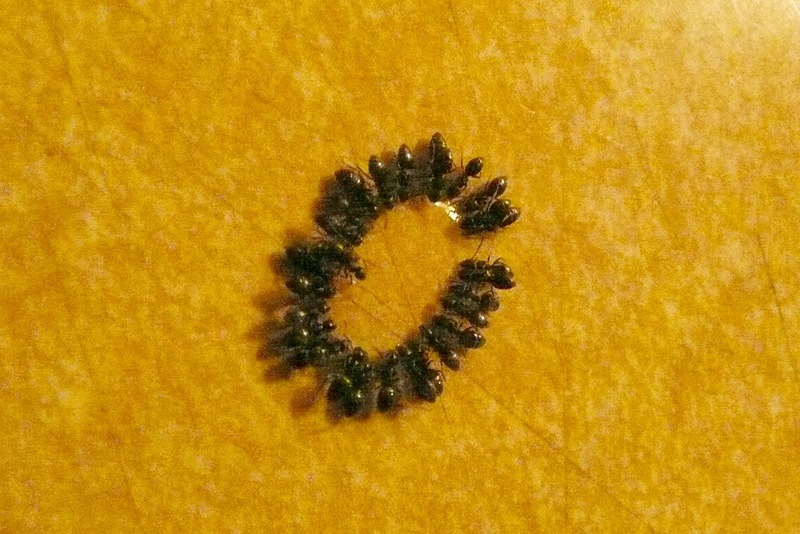 But, on this one very late night, bleary eyed and foggy headed, with my elbows on the kitchen counter, I watched these little ants for awhile as they went about their business. And business it is - these little creatures forage constantly, and when any food to their liking is found, the lone scout immediately communicates the location, by whatever means they have, to other members of their collective and within short order many more arrive on the scene to profit from the feast. Watching them at work, it's obvious they have protocols in place within their society governing their behavior - there is no mad rush or disorganized scramble at a food gathering spot; the ants communicate with each other, and take their places in a very orderly fashion. It's said the Olympian Gods of old toyed with the lives of mortal men in much the same manner of detached amusement or spirit of observation as does a warped child pulling the wings off of flies, or a lab technician testing cosmetics on kittens. Very possibly the ancient Greek Gods, like so many of the iconic figures in religious literature worldwide, are merely metaphors for aspects of the human condition. Well, whatever character trait that may represent, I don't seem to possess it, never have, and quite possibly I have some sort of character flaw that prevents me from ridding the house of ants, or setting a mouse trap, without feeling a sense of - maybe not an emotional pang, but still a small sense of loss. I know that many of you have been given permission by your personal God of choice to have dominion over the earth, and all creatures upon it, to do as you in your wisdom may please. Well, that's great for you; maybe I'm just a bit envious that my own God hasn't done so well by me. These tiny ants, with their tiny civilization, and their tiny social structures and protocols, are after all just a small, almost insignificant part of the marvelous complexities of the great web of life that has evolved on this wonderful green Earth. But still, what a royal pain to have in the kitchen. 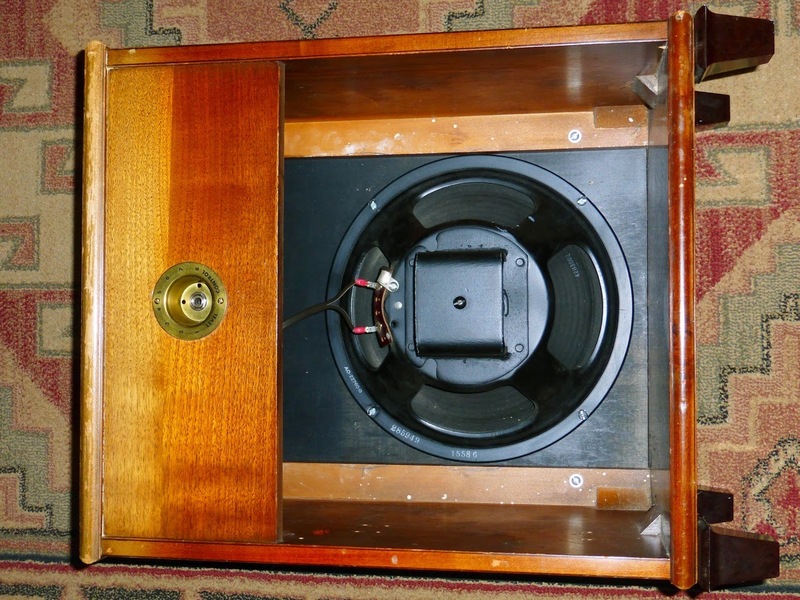 In Part 1, we brought this cute little Hammond M3 extension cab home, installed a 1/4" jack where the volume control used to be, hooked it up to an amp, and rocked out for awhile with the stock Rola organ speaker. 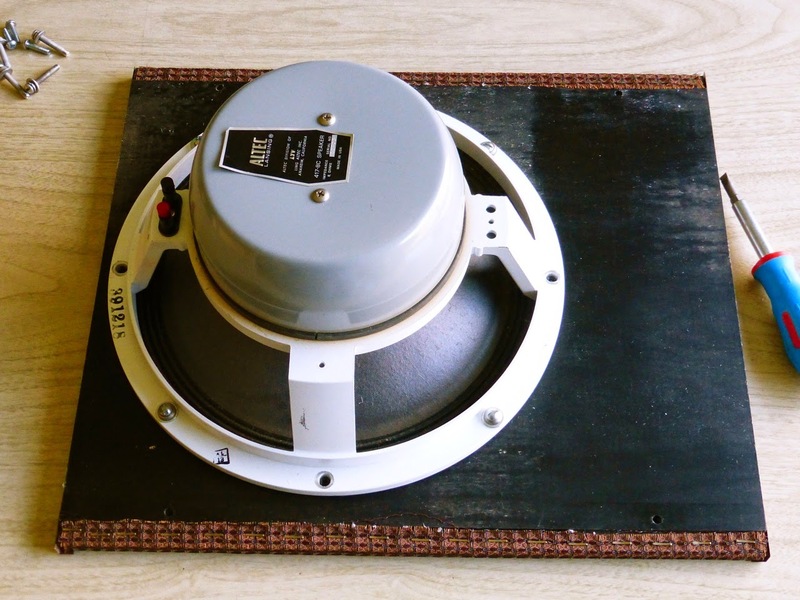 The Alnico magnet Rola is a very good sounding vintage 12" speaker, and eventually it will find another enclosure of its own, but today we're replacing it with my all time favorite guitar amp speaker, an Altec 417-8C. 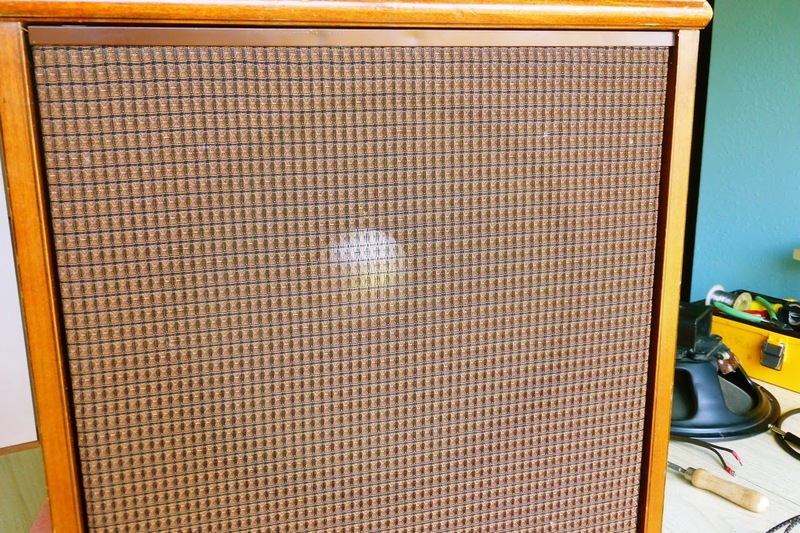 This Altec had been sitting in a box on a shelf in the back room of a music store in a little town in the Southwest, gathering dust for decades, brand new, when I found it some years ago, and it's been in a few amps since then, getting the job done without complaint, clear and toneful at low volume, singing and soaring when pushed, and always sweet. Sharp eyed readers may notice the Electro Voice badge on the grille - it's about the same vintage as the cabinet, late 1950s, and has that similar old fashioned look to it, and besides it needed a home. And since the Hammond cab never had a badge even when it was new, well, why not? 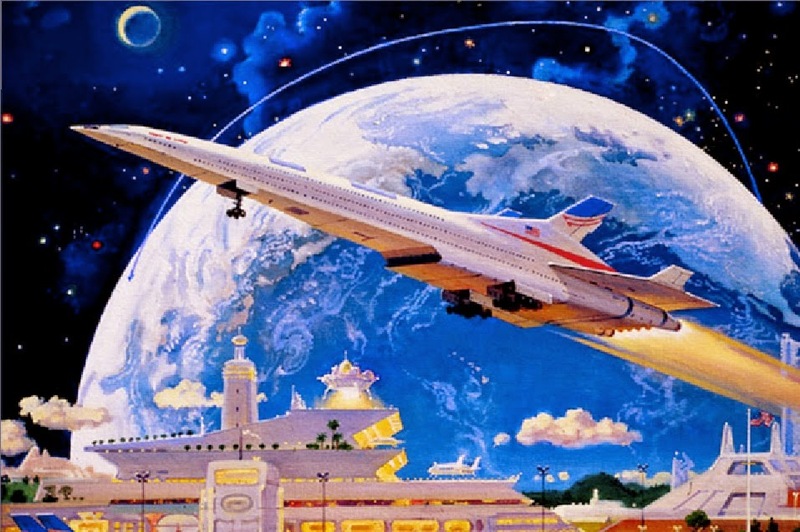 Plus, it looks cool, and that's always a good thing. 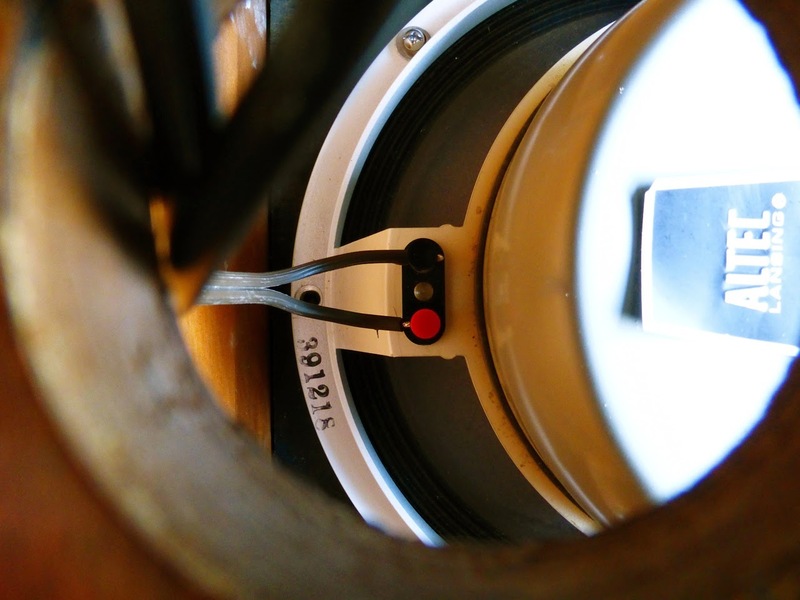 The Rola has a 12 1/8" diameter, but the Altec is 12 1/4", and it's not going to fit in there without a bit of modding. 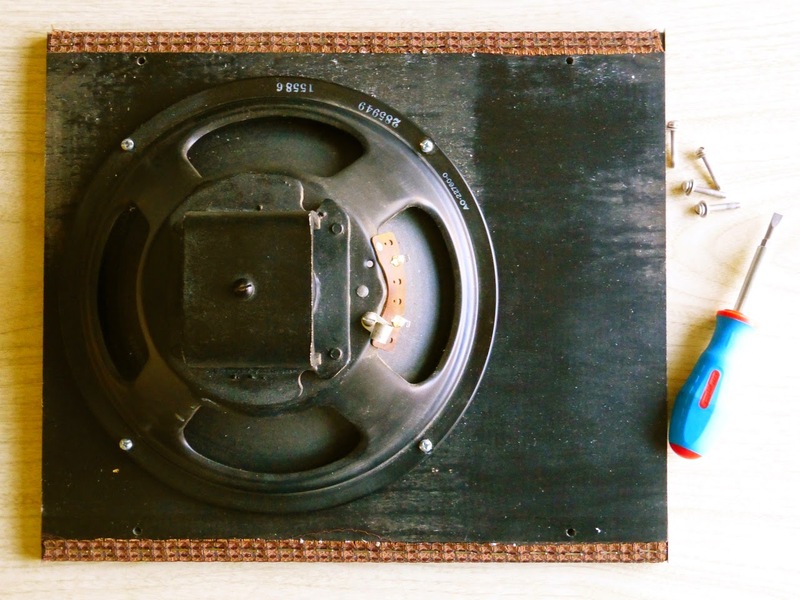 Also, the speaker is mounted toward the bottom of the cab. 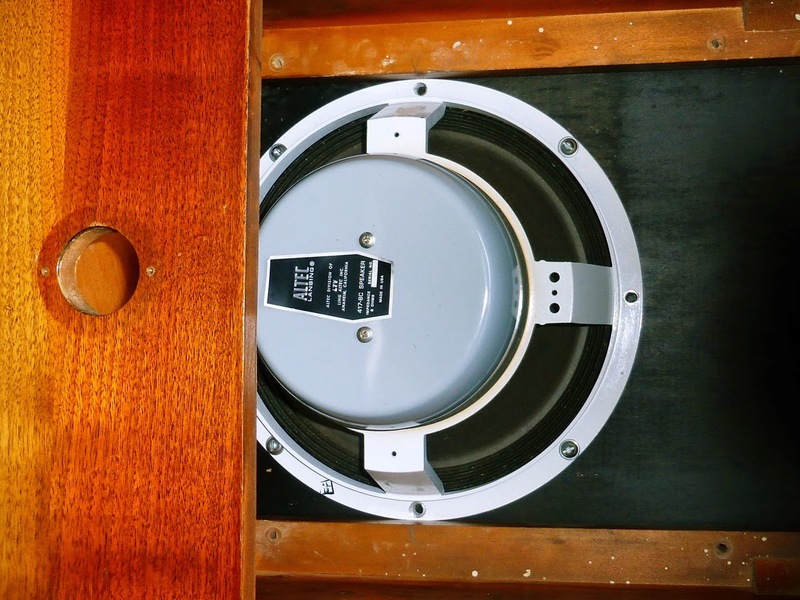 However, since the T-nuts on the baffle board and the holes on the cleats are positioned symmetrically, it will be possible to flip it 180 degrees to get the speaker up near the top of the cabinet, for a clearer tone. Here's a couple initial sound impressions: this cab is unbelievably tight - you can totally crank the volume, and there are no rattles, buzzes or wheezing. As always, the Altec sounds killer - it has ever since it was new, and long may it run. 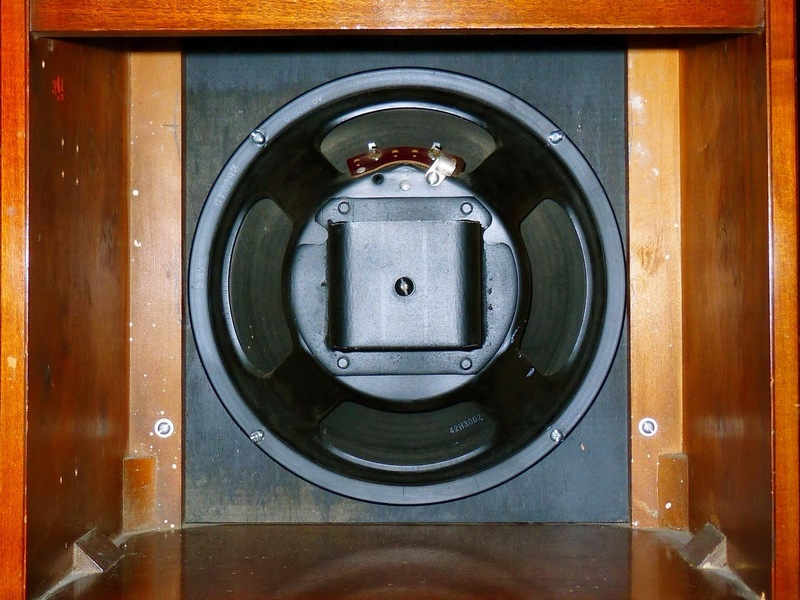 And since this speaker does very well in a Deluxe sized open backed cabinet, it's totally at home in the Hammond cab. 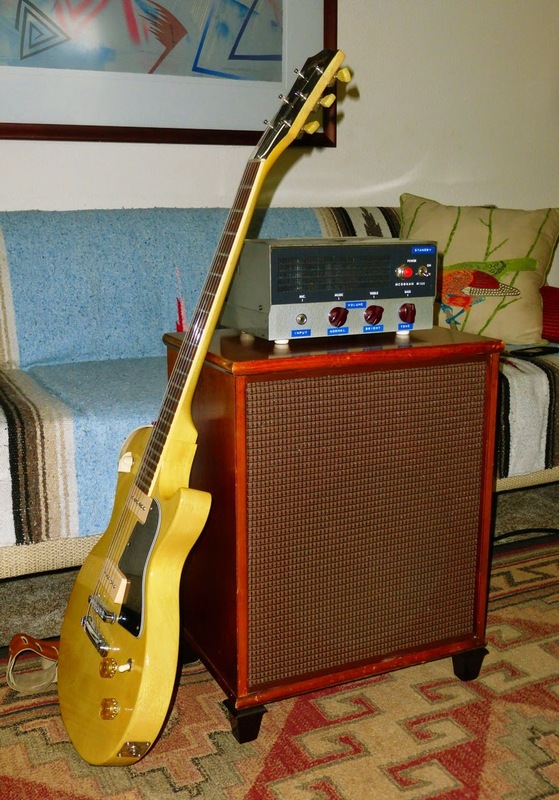 As a living room and home studio amp speaker cab, this combination is perfect, couldn't ask for anything more. 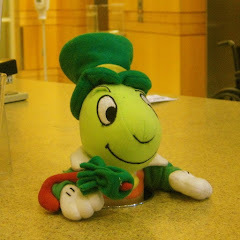 All pictures taken with a Lumix ZS-25. Click or tap on any photo to access larger, higher def images. The picture above gives some idea of how petite this cabinet is - about 16 1/2" wide, 19" high, and 21" tall including the odd looking stumpy short legs. 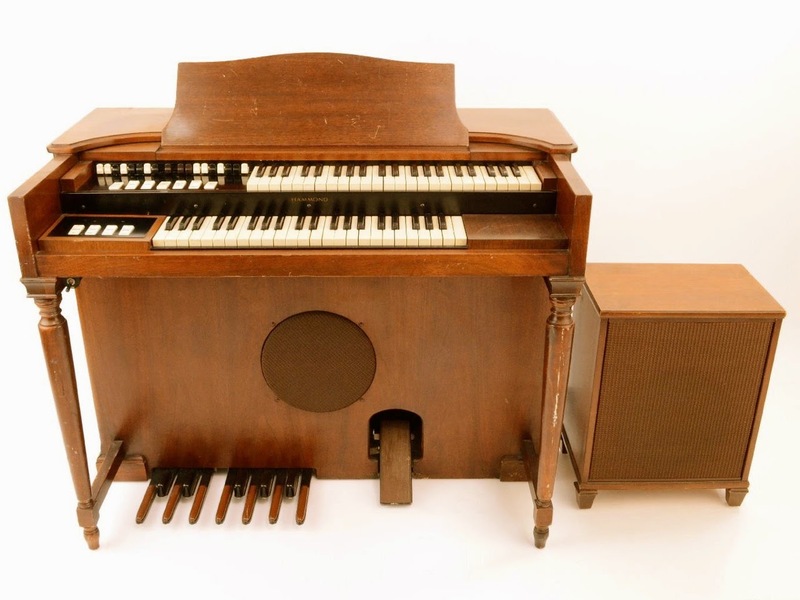 Also, keep in mind that the home consumer market M3 is about 2/3 the size of the pro level Hammond B3. 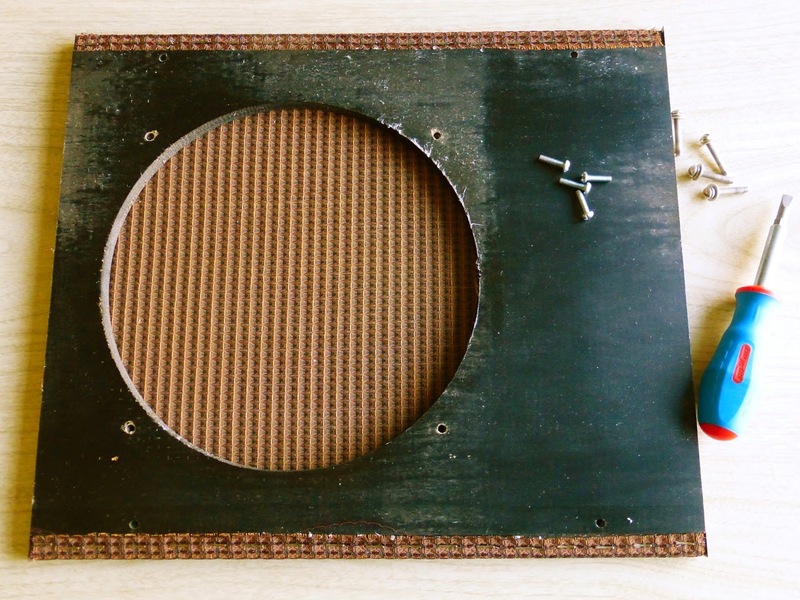 Made for use as an extension speaker to be used with the M3's built in reverberation system, this cute little cab has a style which, like most all of Hammond's products during their Golden Age, can possibly best be described as "Funeral Parlor Chic". 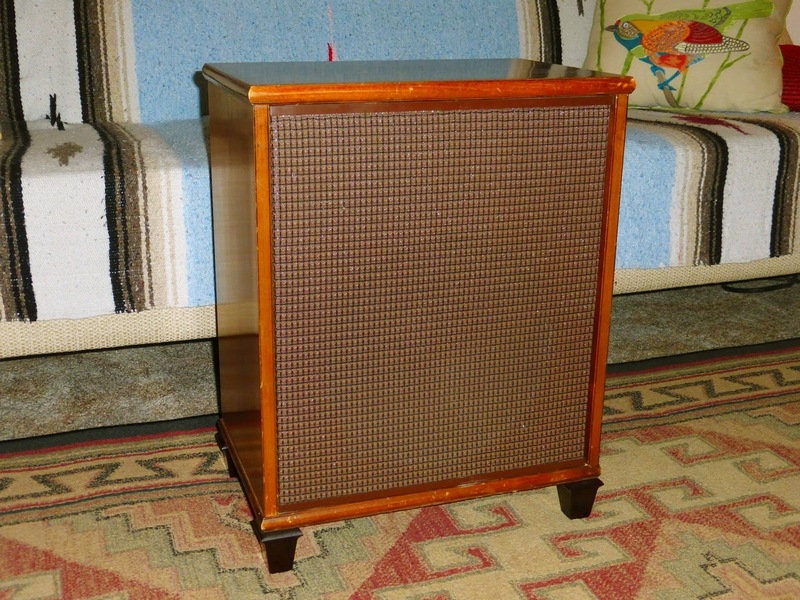 An open back speaker cabinet with an internal volume very similar to a Deluxe or Deluxe Reverb, and with classy furniture styling? 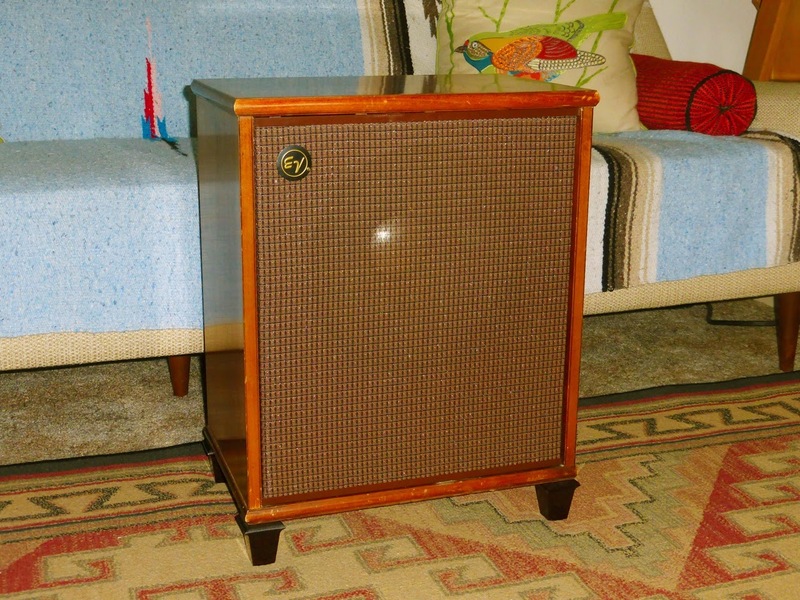 Sounds like a great living room guitar amp cab to me. From the rear, this cab looks a lot like a bedside table. 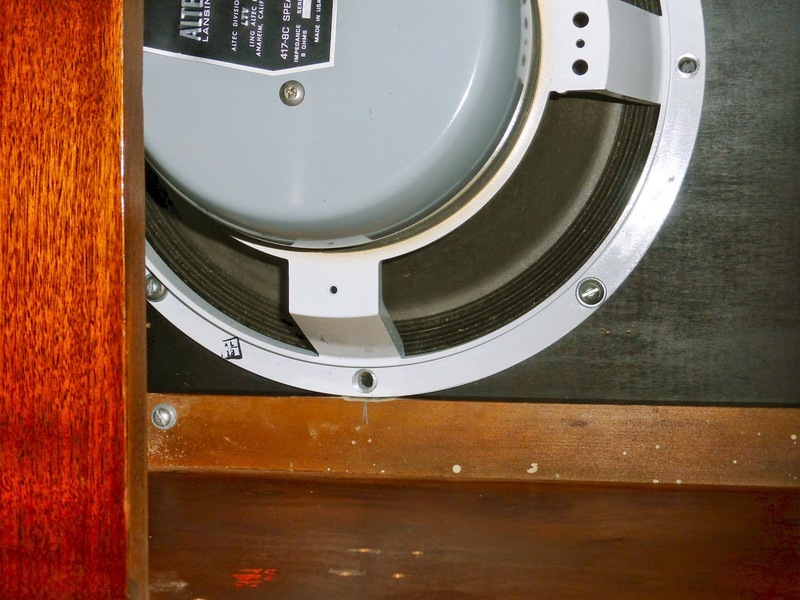 Note the very high quality Rola 12" speaker; inside the magnetic field yoke assembly is one of the largest Alnico plug magnets I've ever seen. 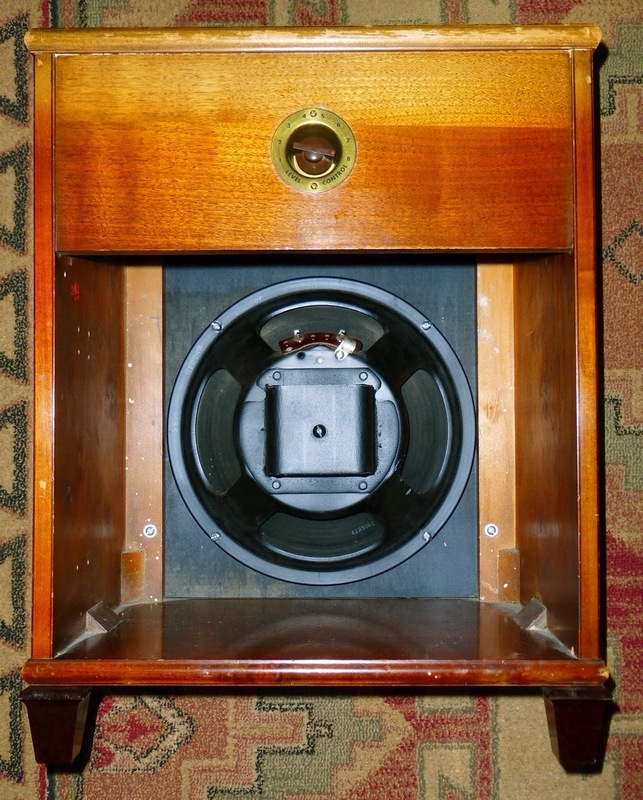 The speaker was wired in series through an 8-position constant impedance attenuator (volume level control); you can see the volume knob nestled inside the brass plated cup in the back panel of the cabinet. And how does it sound? Really nice - this Rola organ speaker has a smooth natural high-end roll-off that complements an overdriven low power tube amp very well. 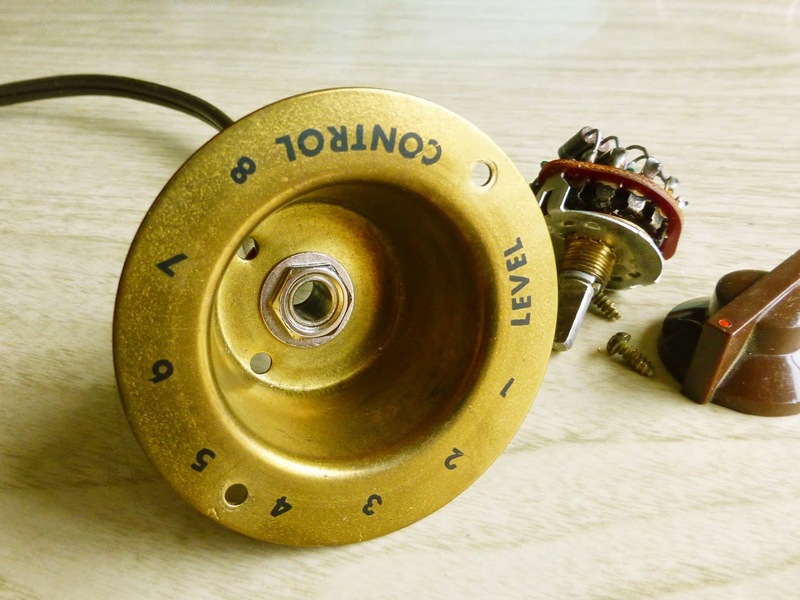 It's also very efficient - maybe it has to do with its large Alnico magnet, or the deep curved cone - it puts out a lot of sound with just a few watts coming in. Never played through a Rola before, and I'm pleasantly surprised at its rich tonality. All in all, a very decent sounding speaker for guitar use, and it makes me wonder what four of these puppies would sound like in a 4X12 cab. And - where have I seen that particular frame design before? 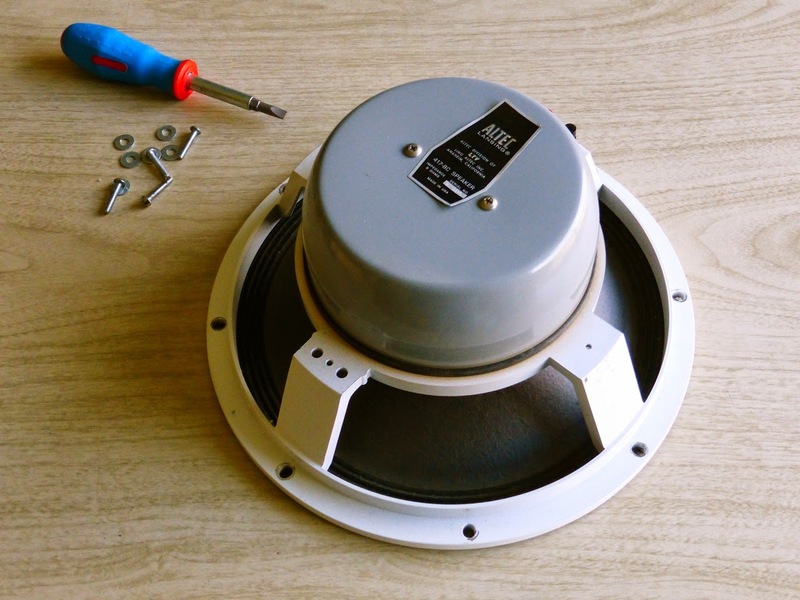 But - we're not done yet - in Part 2, we'll flip the baffle board 180 degrees to get the speaker a bit higher off the floor, and install my all time favorite guitar amp speaker, an Alnico magnet Altec Lansing 417-8C. Stay tuned! Click or tap on any picture above to access larger, higher def images. Most of the photos were taken with a Lumix ZS-25. Picture of M3 with extension cab from Techno Empire.